Summary: Recently, the China Transport industry intelligent research institute on formally being a member of the jining city science and technology association pass the collective deliberation of the Jining Science and Technology Association The Sixth Fourth Committee Meeting. It indicates that our group has taken the lead in the city in the fields of technological innovation, personnel training, and institution building. 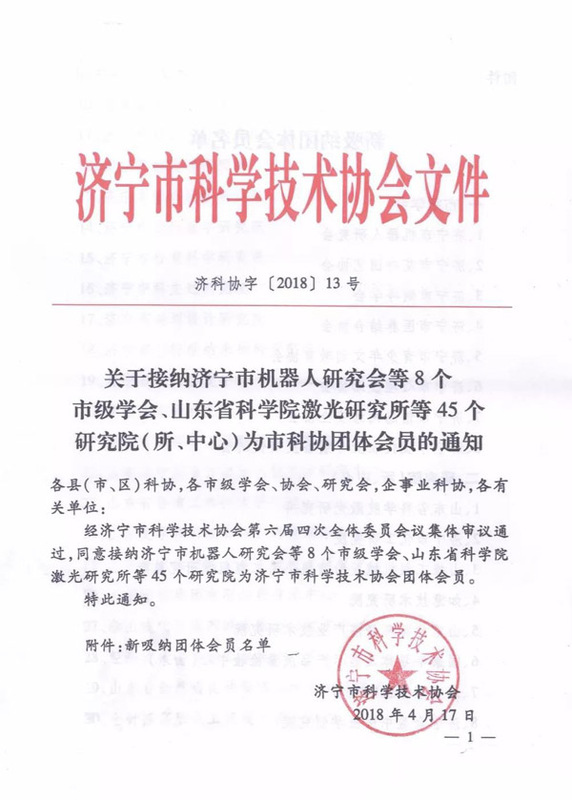 Recently, the China Transport industry intelligent research institute on formally being a member of the jining city science and technology association pass the collective deliberation of the Jining Science and Technology Association The Sixth Fourth Committee Meeting. It indicates that our group has taken the lead in the city in the fields of technological innovation, personnel training, and institution building. In recent years, Shandong China Transport Group has a long-term perspective and focuses on the future. It actively develops and promotes the research and development of intelligent robot technology, unmanned aircraft, aviation models, and vehicle and ship models. It has accumulated rich practical experience for the building of the Industrial Intelligence Institute, and has laid a solid basis. Currently, China Transport has a highly qualified research and development team with a doctoral or master's degree and a skilled technical worker team. It has established strategic relationships with universities and research institutions such as China University of Science and Technology and Beihang University. The cooperation relationship, through the introduction of foreign robot advanced technology, to develop a robot system that adapted to the Chinese market,and now has entered the pilot production stage. Under this background, Shandong China Transport Group based on the experience of smart manufacturing, combined top-notch resource-building intelligent institutes such as well-known universities and research institutes, and is committed to creating a dual platform for technology and industry incubation. The China Transport Industry Intelligence Institute was established in December 2017 and its business department is the Jining Science and Technology Association. This time being absorbed as a member of the Jining City Association for Science and Technology, it will further promote the comprehensive development of Smart Research Institute of China Transport Industry in smart research. We will use this as an opportunity to overcome intelligent manufacturing problems, transform intelligent research results, and actively create industry exchanges. The platform will contribute to the cultivation of new economic growth momentum, promote the conversion of new and old kinetic energy in the city, and promote industrial transformation and upgrading.